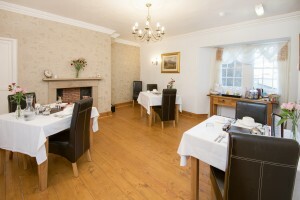 Our Dining Room is located on the lower ground floor, adjacent to our Kitchen. 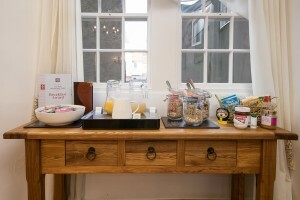 A spacious room with individual tables for each guest but with the flexibility of being able to pull tables together when larger groups are travelling together. 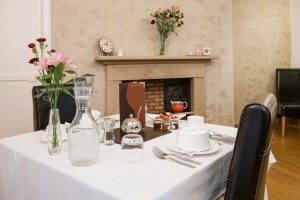 Please check out our extensive breakfast menu which has been designed to cater for all needs. Also, if you are arriving late or just fancy a quiet night in, then try one of our Northumbrian Platters of locally sourced meats, cheeses, pickles and bread served with a glass of wine or Lindisfarne Mead. The platter can be served in your room or the Dining Room. Each platter costs £15 per person. Order your platter when you book.